Our ASA members were recently invited to participate in a Professional Development Session with Ron Nyisztor, 2018 Art Awards Curator and Christen Bell, History House Museum Curator. 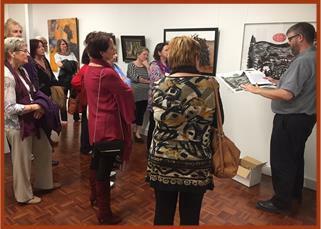 Twenty three of our members were treated to a special preview of the exhibition with Ron hosting a floor talk and highlighting particular points of interest on some of the artworks displayed. Christen also introduced us to tactile tours, showing us how to experience artwork through dialogue and touch. Hopefully we all came away looking at ways to incorporate what we learnt with our own forthcoming October Weekend Exhibition. 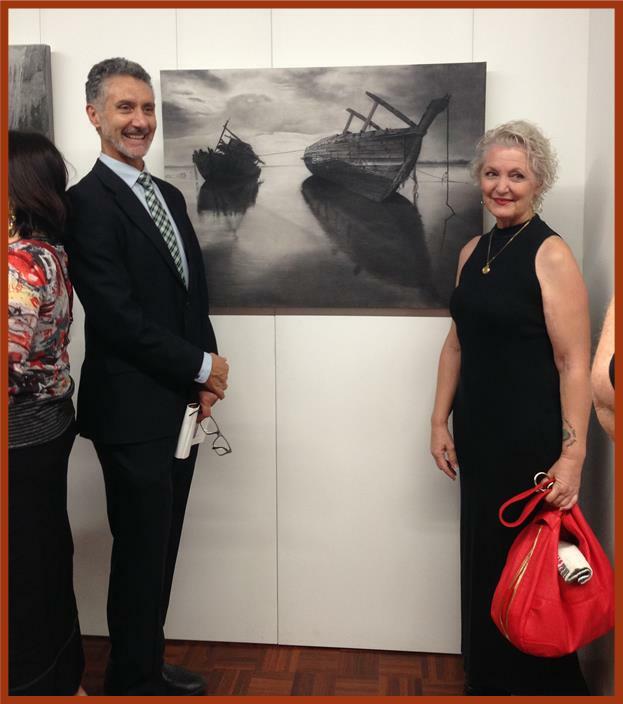 The ASA Committee was invited to the Opening night of the Minnawarra Art Awards held for the first time at the new Greendale Centre in Armadale. We were delighted to view two of our members Artworks on display Cathy Willey and Debbie Banks. 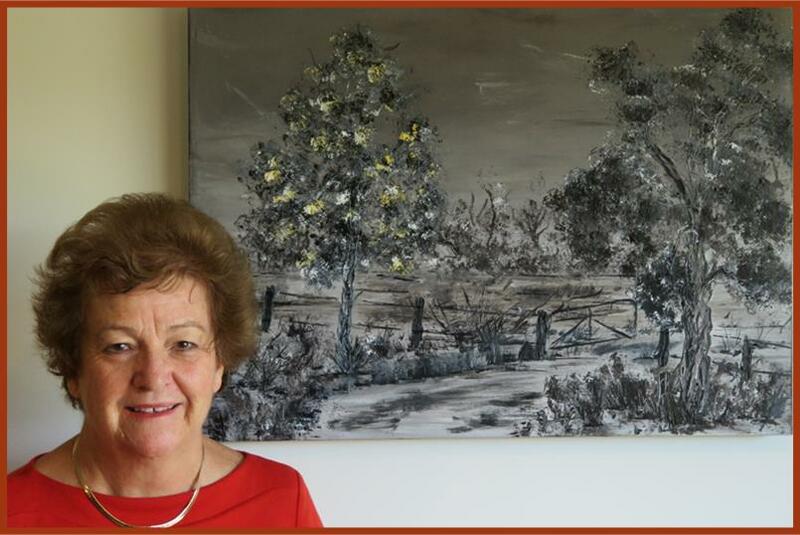 Cathy Willey won the award for Best Local Artist for her painting “Depression Is” Artist for 2018 The Honorary Festival Artist for this year was Cathie Travers, Musician. 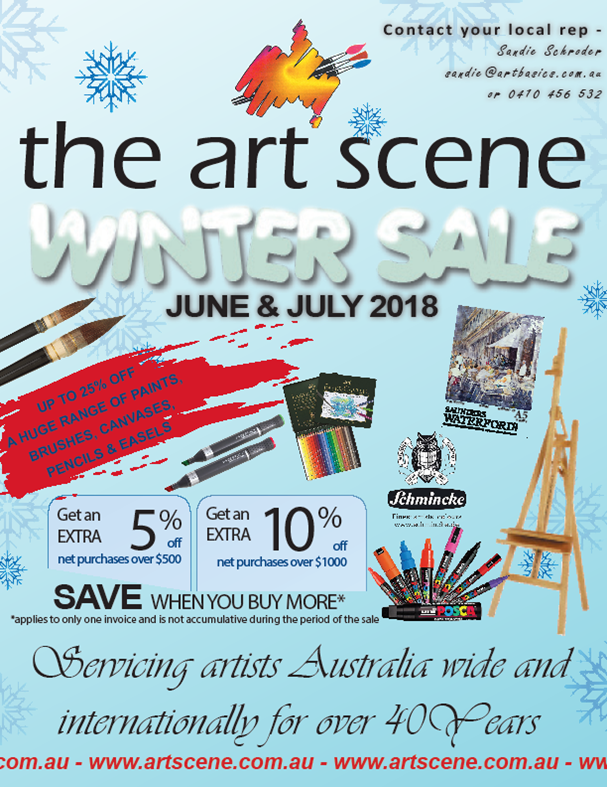 The ASA Pop-Up-Shop and Gallery received great coverage in the City of Armadale’s Festival Program and in the Minnawarra Art Awards Catalogue. Over the two weeks of the Festival any visitors to the shop get a chance to enter two free raffles. 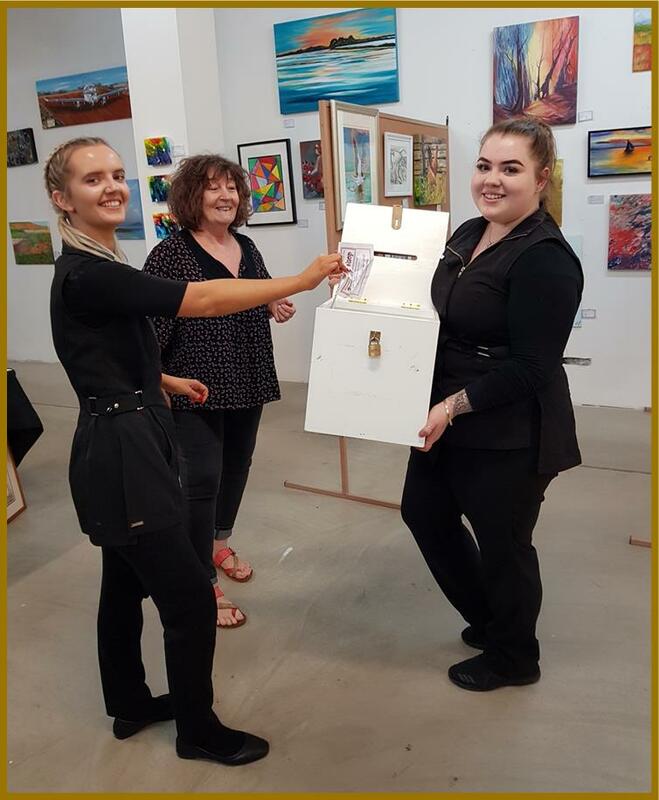 We would like to thank all our rostered artists over that period who were busy painting in the shop and a special thanks to our two members who generously donated their paintings for raffle. Artists: Pam White “Blue on Blue” which was drawn on Saturday 19 and Jane Etienne’s painting “Pilbara Sunrise” which will be drawn on the Saturday 26 May. A special thanks to our members who manned the Minnawarra Art Awards. I hope you managed to get a quiet moment to browse the art on display. The Armadale Arts Festival ran between Saturday12 to Sunday 27 May 2018. Sandie Schroeder from the Art Scene will be at our next Members Night with some specials, and is this month’s guest on our “Sponsors Corner”. Sandie is offering two door prizes one for Trading Table Raffle and the other as the Challenge Prize at the June Monthly Members Meeting along with Catherine Kelley as our guest demonstrator. Please come join us at the Art House. There are classes scheduled each day of the week. You can join in on one of our Informal Groups, or join one of our classes specialising in a medium, it’s great that Ian Kallas Watercolour Artist is starting a 4 week class in July. I have also started an informal group on Friday afternoon between 1pm to 3pm. I have been a lover of oils since I started painting 19 years ago I am happy to share any tips with you. Please bring along a themed painting in any medium or sketching style in a frame or with a mat. 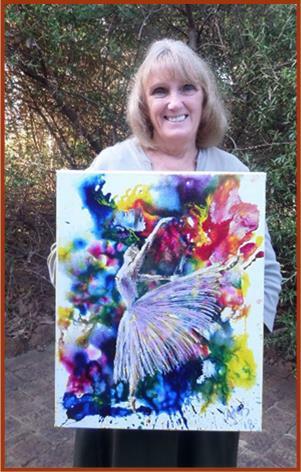 Sandy Schroder from the art scene will also have a trading table at the meeting offering some sale items. Sandie is generously donating our raffle prizes for our June meeting. Above: Dave Archer with last months demonstrator Karen Barnes and his prize winning picture. Enlarged below. We have an extensive range of art reference books and DVD’s you can borrow from our library. .In the absence of Librarian you can still borrow by recording details in folder on the library table. Books can be borrowed up to 4 weeks. Each category/item has its own record sheet. Could you please fill in the appropriate details and with DVD’s limit of two at a time, and for a two week period. We have been approached by Janet from “Mat with Janet” to run a workshop which we are looking at scheduling on a Sunday in July. This workshop will run for 3 to 4 hours for up to four people at a time. What you will learn is how to measure up, logan cut your ‘mat’ boards and display your paintings with pride. The cost will be $40 per person. We will include further details in the next Newsletter. We are still happy to offer a Print Making Workshop, date to be decided on in July or August. Marlene Wilson from Beverley is offering to run a Dry Point Etching Workshop (Print Maker) price would be $120 and this includes all materials. You will take a beautiful Print Making art work home with you. Saturday 7 July 1 to 3pm for 4 weeks. Please see further details in Newsletter. Trish on 0455 552 842. We will no longer be stocking canvases and we are sorry for the inconvenience caused. The good news is that our local suppliers RIOT Art & Craft, Jacksons, Oxalades & The Art Scene have good specials throughout the year on a wide range of sizes of canvases. We will endeavour to display flyers in the shed and share on our Facebook page. All our suppliers have a mailing list that you can subscribe to and receive by email. Our members have donated their time over many years to produce original artwork for the front cover of our Exhibition Programs which we sell for $5 at our Annual Exhibition.. We have placed some boxes in the shed with art paper and also a box for completed works and would appreciate your help in creating some colourful and creative covers for our forthcoming Exhibition in October. All you need to bring is lunch. If you have always wanted to try resin, but don’t want to buy all the stuff needed (it’s not cheap! ), come along and play for the day! $120 everything supplied, including the resin, several small boards, inks, paints dust etc. Sunday 24th June part one—build your model, and Sunday 1st July decorate. $60 for the course, further information to follow. 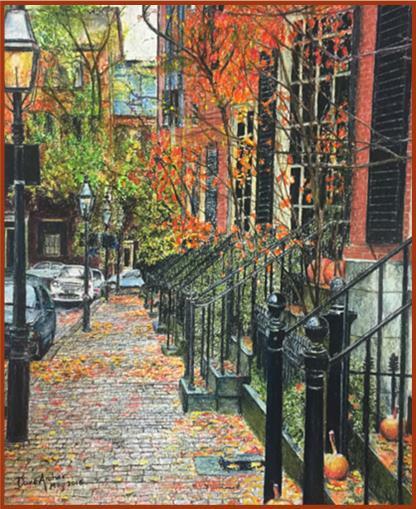 I am most drawn to streetscapes and perspective scenes especially with high detail. I guess it’s my love of drawing which has steered me in this direction. Ever since childhood, I have sketched and drawn. Water colour was my chosen medium. Only as an adult, at one of my hosted art evenings, a school art teacher friend introduced me to soft and pencil pastels. It was without a doubt a revelation for me. At last a medium I could apply with exactly the result I was looking for. It’s sketching, but just so much more. It offered rich colours which can be blended and is just so portable. I prefer to work on smooth paper using soft and pencil pastels, which I find allows the high detail that I like. I am totally self taught and have never attended any demonstration before. Over the years I have travelled extensively for work. Business travel affords one with so many hours alone in hotels. My sketch book and a hand full of pastels is all I need to pass the hours. More recently I have begun working with acrylic paints. I am currently building a pipe organ which will be highly decorated with Acrylic painted murals. I have chosen an African theme. 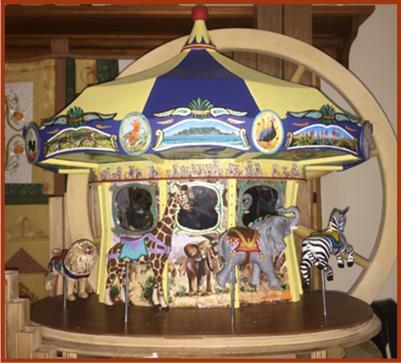 I have completed the central featured Carousel. The Animals are all hand carved and in the finished work, the animals are mechanically connected to move up and down as the big bellows drive wheel rotates. More on this at a later time. My love of woodworking together with drawing and art in general has made this project, of my own design, a challenge that I am thoroughly enjoying. Both my wife Jackie and I are very creative and so our home is filled with our creative treasures. We do battle over wall space. Finally I would like to express my thanks to my Wife for pressuring me to join this wonderfully friendly society and also I would like to express my thanks for the recognition of only my first ever displayed artwork. I have been most humbled by this experience. The Armadale Arts Festival has bought us lots of interest and an increase in visitors calling into our Pop Up Shop. Our Free raffle, as part of the Festival has proved very popular. 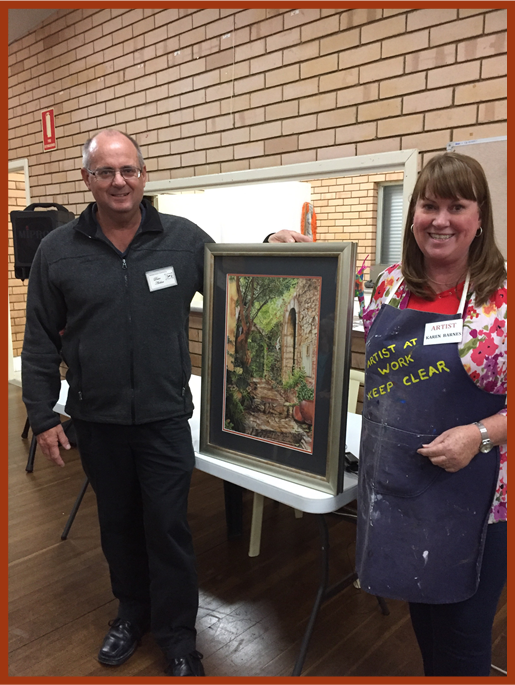 The first weeks raffle was drawn on Saturday 19th May and the beautiful watercolour painting donated by Pam White was won by John Mason from Gosnells. I had the pleasure of calling with the good news to be greeted with squeals of delight from the winners. Thank you to Pam for your much appreciated donation. The second raffle is starting on the 21st May and is drawn on the 26th. This is a painting donated by Jane Etienne. The raffle has also given us a record of names to include in our data base for future events. We are hearing very positive comments in regards to the artworks we have on display and the presentation of the shop. Since reopening after the Easter break, we have sold 56 painting plus 5 on laybay. This is after only 38 days of trading! A fantastic result! We have recently had 2 new artists join the shop and look forward to welcoming a further 5 artists ready to join us in June. Sarah Johns and Sarah Boydell who drew the raffle (pictured with the lovely Sandy Spindler). Thank you to the lovely Mary Jarret for being our roving reporter! A camp venue and date has been set!! 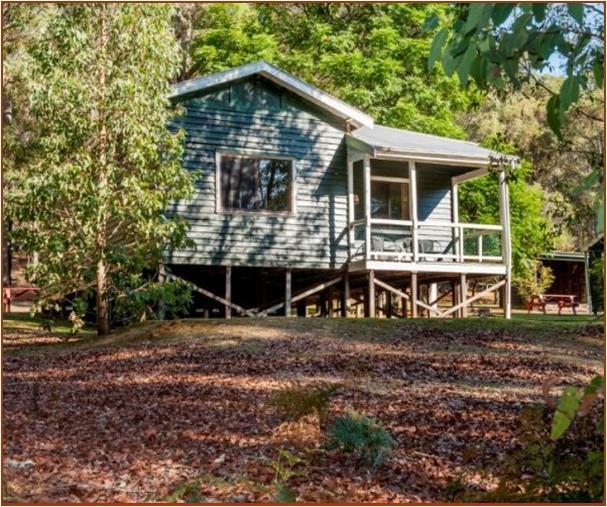 From 5th till 8th July at Wellington Forrest Cottages, in the picturesque Wellington Mills. Each cabin fits 8, and is $165 per night. Each person would share the cost, so if 8 people come, it will only cost you $21 per night! Excellent value! Please contact Sandra Reynolds for further information and to come along! Trish & Jo will be holding an afternoon tea on Saturday 23rd June from 2:30pm. My art began with stitch and I have exhibited in many textile exhibitions over time. Wanting to paint and draw, and a chance meeting with some artists led me to ASA and Art House. Being part of the Art House community has been very special, and a wonderful training ground for my current interest in Pastels and Acrylics. My mentors at Art House have been Dot Marshall, Hazel Moore and Geraldine Gustavino. I am very grateful for the opportunity to put some work on the wall in a testament to those who have helped me so much. Trish will be at the Art House on Saturday & Monday afternoons. I started painting in Zimbabwe, where I lived on a farm, not far from our local town. I was very fortunate to have many experienced artists in the community, who inspired me. Political upheaval in Zimbabwe, resulted in us immigrating to Auckland, New Zealand and then to Perth. Wherever I’ve lived, I tried to attend art lessons and using different mediums. I have used oils, acrylics and water colours. As a primary teacher, time for personal hobbies has been a challenge, but I am now semi-retired and am hoping to have more time to pursue my art. I am delighted to have the opportunity to develop my skills as a member of Armadale Society of Artists. Jo will be at the Art House on all Saturdays in June. I have been a member of the Armadale Society of Artists for five years. 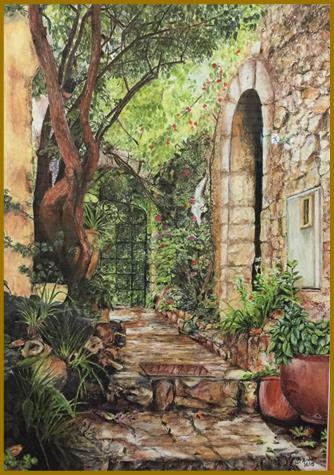 I have always enjoyed painting, and while I mostly work in acrylics, since joining the art house I have been inspired by Dot Marshall; Geraldine Gustavino, and Leesa Paget to experiment with mixed media techniques. 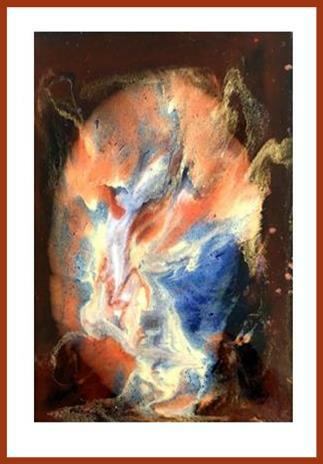 I love this medium, it is exciting to see the effect that can be created adding all types of materials to my artworks. Angela will be at the Art house on all Saturdays in June, except the first. 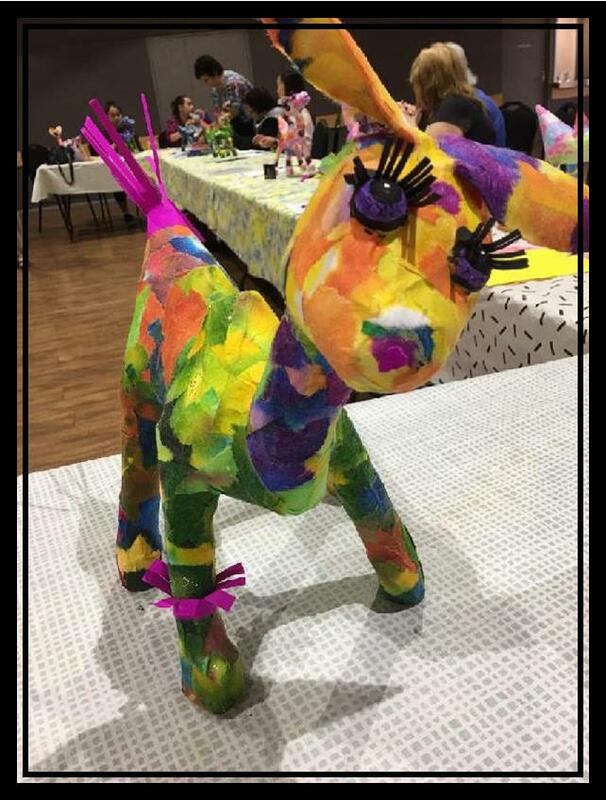 The Art House and Gallery, 63 Railway Ave, Kelmscott Open: Friday & Saturday, 10am-3pm and during classes.